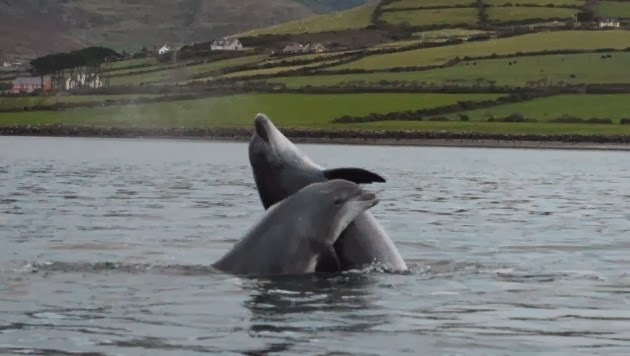 Jeannine Masset and Rudi Schamhart of the ‘Fungi Forever’ Facebook group caught some beautiful snaps of the famous Fungi the Dingle dolphin playing with two pals this weekend. Masset and Schamhart says they've spotted other dolphins in Dingle Bay "on several previous occasions over the years”. It seems that these two visitors were different. They were welcomed by the Dingle tourist attraction, Fungi. They said "On other occasions during visits of other dolphins, he might hide near the rocks or defend his territory. However, they added "these two were very welcome". Apparently the trio played about "the whole day and evening".